This article covers how to set up a Multilingual Knowledge Base. Multilingual knowledge base will be available for “Fantastic” and “Enterprise” plans. Currently our Multilingual KB supports 14 languages to choose from. Prerequisite to this, is to have collection of articles in preferred languages (Maximum of 5 languages) written. ● Go to Knowledge Base >> Languages. ● The first section shows the list of languages that we currently support. The 'primary language' of the knowledge base is determined here. Choosing the primary language will improve the quality of keywords search in the Knowledge Base, in that language. The primary language once set, cannot be changed. The list of languages here is determined by the languages currently supported by PostgreSQL (the database HappyFox uses) for their full-text search. ● After Choosing the language hit 'Confirm'. This will set your preferred primary language. ● If you're subscribed to Fantastic or Enterprise plan, you can see the 'Modify Language Settings' as below. In the list of languages shown, HappyFox currently supports adding a maximum of 5 languages excluding the primary language. Users can control whether they wish to show a particular language in the Support Center pages. This is particularly useful when the multilingual content is being worked on or translated and only upon completion needs to be shown in the Support Center pages. For example, Nederlands is not selected here in Support center view. This will hide Nederlands from the Support Center drop down. Once the content for Nederlands is ready, you can check it to make the Nederlands drop down option available. Having sections for the different languages you've selected, is mandatory before adding translated articles to those sections. ● Go to Knowledge Base >> Sections to view the list of sections you have. ● Click on the ‘+’ icon to translate the section into a new language. 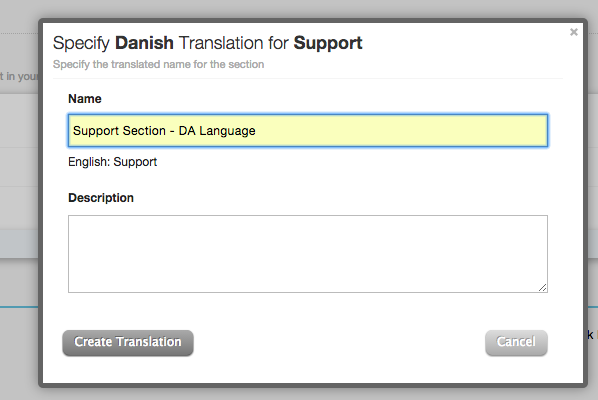 ● In the face-box that appears, Enter the Section name in Danish language, and click Create Translation. ● Now you can see a green '√' mark instead of the '+' mark. ● Translating sub sections - When user tries to translate a sub-section of any section and the parent section does not have a translation (in that language) yet, then the user will be shown a sort of wizard inside a face-box to translate the parent section first and then the sub-section. This applies for any level of sub-section that may be present in an account. ● The articles in the knowledge base can be accessed in the Knowledge Base >> Articles page. The articles list will now show the list of languages that have been added on the account and the current translation status for each article ‘+’ - if a translation is not present and a green ticket √ if the translation is already available. ● When you click on adding a new translation for an article, the user will be shown a page where the new translation can be added along with the reference of the existing article in the primary language, shown on the side. ● The article translation can be created in this manner and saved. ● If a user tries to translate an article into a language where the section/sub-section does not have a translation in that language, the user will be prompted to complete the section/sub-section translation first before doing the article translation. Once this is done, the section/sub-section translation will be saved and the user can proceed to translate the article. ● Editing articles and translations - To edit an article, click on the edit link along the article in the Knowledge Base >> Articles page. To edit a translation of an article, click on the green ticket against the language column which you’re editing. ● Tags and Attachments for articles - The tags and attachments of an article are valid across translations of the same article. So, if you’re editing tags or attachments in any article, this will apply to the other translated articles too. The tags and attachments can only be edited in the primary language article. Views and useful/not useful counts are kept separate for each article and its translations. If you'd like to provide multilingual attachments, you can attach more than one files for each article. This way the viewer gets to choose the one they like to download. ● Select the language from the drop down on top right. ● Translated Section, Subsection and Article names will be shown here. You can choose to View, Edit or Delete these articles from here. ○ The list of languages chosen to be made visible in the Support center is shown as a drop down in the top right in the support center pages. Users can switch between the languages available and the sections/sub-sections/articles which are translated will be shown to the user. ○ The support center is loaded by default with the primary language that is set up. ○ On clicking into the Section, Sub section and articles are listed in the relevant language. How to add images to a Knowledge Base Article? How to embed videos in a Knowledge Base article?